While the control equipment is relatively current for the 14 pump stations that handle wastewater flow, the control strategy was bit antiquated. The system required a visit to each station 365 days a year. With the addition of three new pump stations the task of manually monitoring the system is more burdensome. To avoid adding head count, the WPCA installed the capability of automated on-line monitoring. The monitoring system involves capturing vital information as tank levels, pump run time, electrical failure, flow rates and the like. This will allow an audit of each sub-area to be sure the revenue generated matches the flow. The entire project was completed and operational at the end of September 2010. 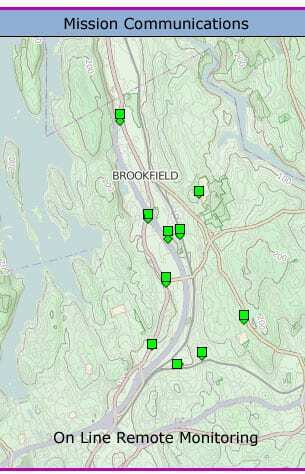 This system includes rain gauges at the North and South end of Brookfield. This assists in determining the extent of any ground water infiltration into the sewer system. Reducing or eliminating ground water infiltration could be a significant long term savings as the toll fee for processing wastewater is based solely on the quantity or wastewater sent to the local treatment plant. This initiative showed that about two-thirds of the flow in Brookfield comes from the Southwest district. As a result, four additional monitoring points are due to be installed in 2012 with the construction of the new Grinder in at the final pump station on Federal Road. A dot moving around the square indicates a pump is running. Mouseover a square to view current status. Map and schematic of the Brookfield sewer infrastrure at bottom of the Brookfield page.